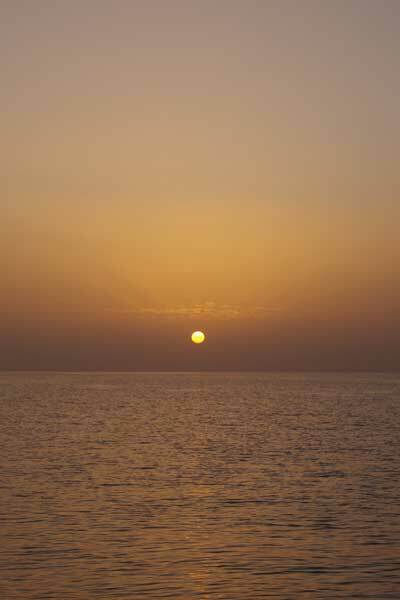 The last sunset during our time in the Exumas. We were sad to see our time in the Exumas come to an end, but it was time. 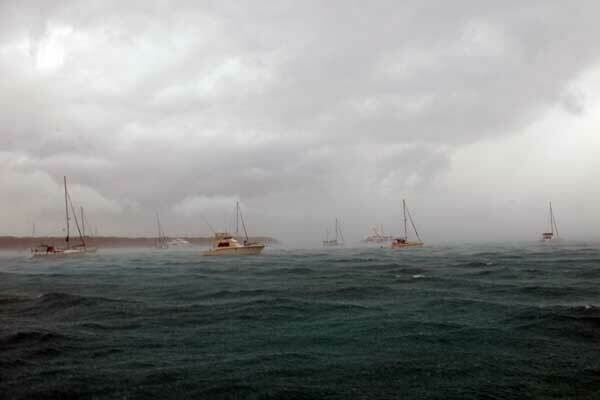 We saw 49 knots on our wind meter when the storm passed through! After a week of hiding out at Staniel Cay due to the Tropical Low that eventually became Tropical Storm Anna, we were going a little stir crazy to start moving again. Our buddy boat friends were moving on and we were close behind them. After a third visit to Warderick Wells Cay, we left the Exuma Land and Sea Park behind and made it to the famed Norman’s Cay, a former drug runner hideout and all together beautiful place. Carter loved snorkeling the plane. The coolest kid on the block! A lonely plane crash on the inside cove of the island is a relic from the battle between the drug lords and the US Coast Guard; it also happens to be a great snorkeling spot. 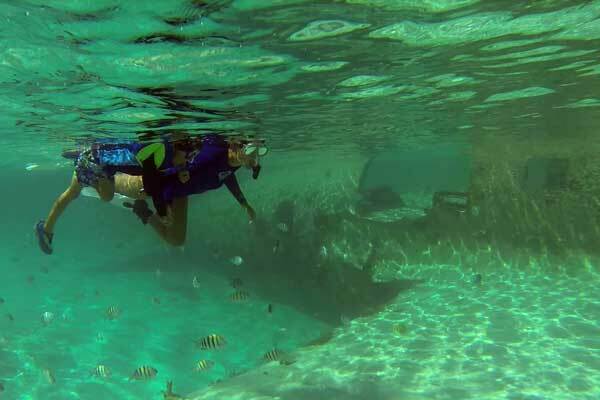 Carter is really getting the hang of snorkeling now and loved seeing the sunken plane! 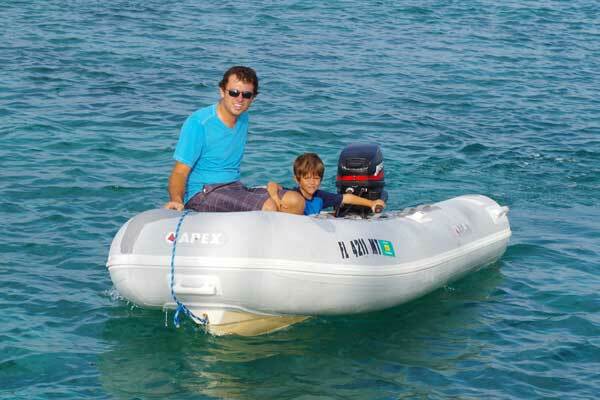 He also got some dinghy driving lessons from Dad, which he did very well at considering he can hardly see over the front of the dinghy from the driver’s seat. Our special guest for dinner! The perfect meal for our 500th mile! 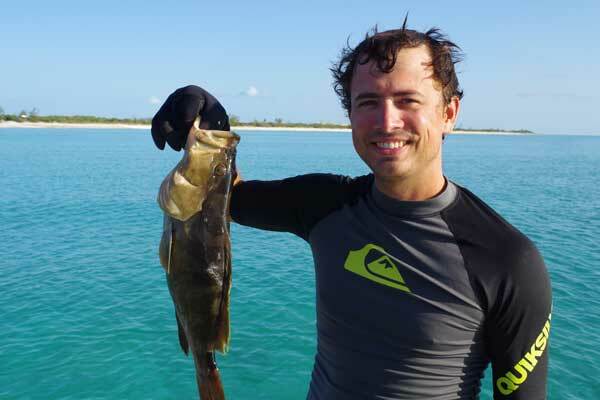 Norman’s Cay marked 500 nautical miles traveled on Horizon and a grouper decided to stop by for our celebratory dinner! 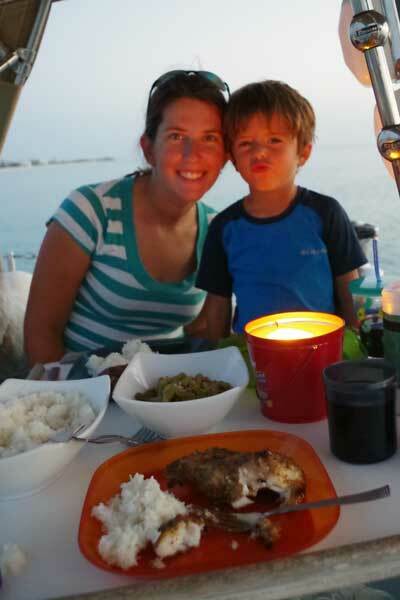 A candle-light (just because it was citronella doesn’t make it less special…) dinner of grilled grouper was just the right touch and one of our best meals aboard so far. Thirteen pounds and 36 inches, a record we hope to beat in the future! Our last stop in the Exuma Cays was at Ship’s Channel Cay, a great overnight stop before we would head out across the Middle Passage to Northern Eleuthera and the Abaco Islands. 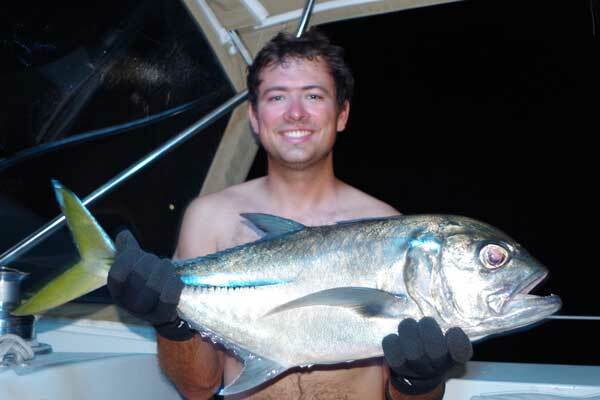 That night as I was tossing dinner scraps to the friendly remora under our boat, a huge Crevalle Jack decided he wanted a bite as well. Dan attempted to catch him for half an hour or so, but couldn’t get him to bite. After cleaning up, we accidentally left the pole in our rod holder and went to bed. At about 11 o’clock that night, we starting hearing the whirring of the reel and we both rushed out to discover he had finally gotten his bite! The half hour fight that ensued, chasing him around the boat with me holding the flashlight and Dan reeling him in, will certainly live on as a proper send off from the Exumas! We loved the Exuma Islands and hope to return to visit again. 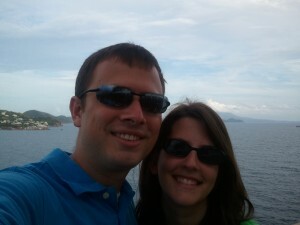 Our first real cruising grounds will be hard to beat in our future travels. Nice fish! Glad you’re having an amazing time. We hope to cross from Miami to Bimini on June 1st or shortly thereafter. We’d love to meet up for dinner if you’re in the area about then. Let us know.